April 23, 2019 -- Santa Monica College (SMC) students can start adding to their scholarship fund as early as their first semester under a new program announced by school officials last week. April 22, 2019 -- Assemblymember Richard Bloom's bill that would levy a 2-cent-per-ounce tax on sugary drinks to fight obesity has been shelved until next year, the former Santa Monica Mayor annouced Monday. April 22, 2019 -- A total of 1,762 units have been proposed under the Downtown Community Plan (DCP) approved two years ago, which foresees 2,500 new multi-family units built through 2030, according to a status report from planning staff..
April 22, 2019 -- The City Attorneys office last week filed a criminal complaint charging the owner of a two-unit rent-controlled apartment with five counts of tenant harassment. April 8, 2019 -- In a sign of the times, the Planning Commission likely will have an updated mission statement the City Council is expected to endorse Tuesday night. April 18, 2019 -- More than $16,000 were raised on the first day of a fundraising drive to aid the family of Santa Monica Police Officer Rashad Riley, who drowned Friday afternoon off the Hawaiian island of Kauai. April 18, 2019 -- On Monday, public transit passengers and motorists began heading to the City's new transit center in Downtown Santa Monica to purchase everything from bus passes to parking permits. April 17, 2019 -- Santa Monica businesses that have been operating without a license can have the lion's share of their penalties reduced under the City's Business License Compliance Assistance Program (CAP). April 17, 2019 -- There's no debating it, the Santa Monica College (SMC) Speech and Debate Team is the best in the nation. Team captain Shaindi Schwebel (center) took first place in International Public Debate at the Phi Rho Pi national speech and debate tournament in Reno, Nevada this month. April 16, 2019 -- Kenneth Karst, an influential constitutional law scholar at UCLA who lived in Santa Monica for nearly 50 years, died last Tuesday. He was 89. 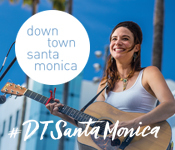 April 16, 2019 -- Six local arts leaders will be recognized by the Santa Monica Arts Foundation next week for their support of the city's "vibrant" cultural scene. April 12, 2019 -- It takes Santa Monica police an average of 4 minutes and 37 seconds to respond to a call for service, and 39 percent of the city's seniors have a library card. These are some of the statistics that can be found on Santa Monica's new online dashboard. April 10, 2019 -- The site of a public parking structure Downtown will be used to provide affordable housing for Santa Monica's homeless and live-work spaces for artists. April 8, 2019 -- A considerable portion of our rental units are owned by individuals and small enterprises, and Santa Monicans for Renters' Rights (SMRR) has stolen their wealth to pass it on to others, says Kip Dellinger, a prominent tax analyst. April 5, 2019 -- Miles of Santa Monica streets will light up with rainbow colors in June as the city holds its first SaMo PRIDE, a month-long celebration of the LGBTQ+ community. The festivities and programmingc celebrate "individuality, empowerment, and inclusivity within Santa Monica," organizers said.